I’ve been an athlete my entire life starting in sports at a young age. You name it I was doing it at some point. In middle school, I began running and lifting dumbbell weights after watching my parents and because I was always trying to lose weight. As a young teenager, I trained in Martial Arts and Champion Kick Boxing earning my first degree black belt. In high school, I played varsity tennis and softball but was still only running as exercise, even through college. 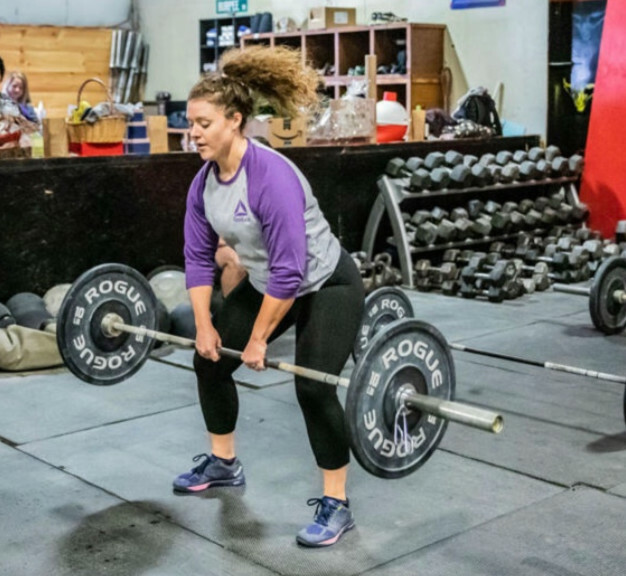 After suffering from knee and shin pain I found functional fitness training as a way to cross train and recover to run again but my trainer at the time encouraged me to visit a local CrossFit gym instead. I walked into Claddagh January 9, 2016, and have been a member ever since. Everything about CrossFit is what I’ve been missing in my sports training and fitness journey my whole life. There is so much variety in movements and workout styles. It makes me a better athlete and a more well-rounded athlete. Here you’re part of a community where we cheer in each other’s successes and motivate through failures. It’s also been the most positive impact on how I carry myself and treat my body. It’s not about what you look like it’s about what your body can do. I pursued certification because of the passion I have for CrossFit in my life and I want to share that and help others feel the same. Its all about having fun, moving well, getting strong and celebrating all you can achieve when you work hard.